Summer is is just around the corner, do you know the basics of RV maintenance. Having a basic understanding of RV maintenan ce is important for every RVer because it ensures your RV is well cared for and ready to go for the season. Maintains your RV also ensure that you get the most life out of it and can trade it in and get a great price when you’re ready to upgrade. 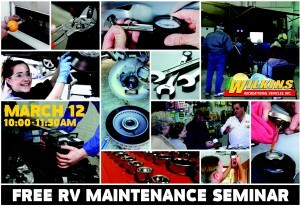 On March 12, we will host a free RV Maintenance seminar at both our and Rochester RV dealership locations. Join us from 10am – 11:30am. Meet other RVers and hear from our experienced team on how to maintain your RV. Get better gas mileage, improved towing and increased resale value. electrical and brakes – safety is important! Understand how to make sure you can stop at a moment’s notice. RSVP Today online or for more information, call toll free at 800-724-2105 ask for Tammy or Kim.